SPOOKS #3 In STORES APRIL 9th! The SPOOKS team undertakes a dangerous mission to rescue Frank from the Witch’s lair, where he’s being held captive. Once inside the Haunted Manor, Zach and Felicia face unimaginable horrors as they journey deeper into the heart of darkness. Meanwhile, the Witch prepares to unleash a devastating spell that will doom all of humanity. The first issue of SPOOKS, the explosive military horror comic by Ryan Schifrin, Larry Hama, and Adam Archer, hit stores February 13, and already the reviews are dynamite. SPOOKS #2 hits stores mid-March, with covers by Federico D'Alessandro and Adam Archer. 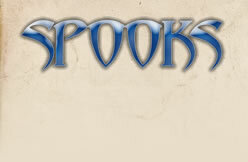 SPOOKS is TM and © 2008 Red Circle Productions. All rights reserved.